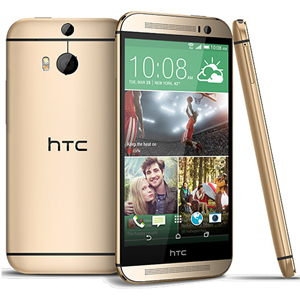 The HTC One (M8) is HTC's flagship phone for 2014 announced in March of the same year. The revised HTC One has a similar form factor to the 2013 edition, with a curvier metal surface available in Amber Gold, Gunmetal Gray and Glacial Silver. The new HTC One features a 5-inch 1080p display, 2.3 or 2.5 GHz Snapdragon 801 CPU/GPU, 2GB of RAM, enhanced "BoomSound" speakers, a 2600mAh battery, up to 32GB of internal storage and support for external microSD cards up 128GB. One of the most unique features of the HTC One (M8) is its new "Duo Camera." This camera features two sensors: one Ultrapixel sensor and one depth of field sensor to allow users to select the image focus after the picture has been taken.